Delta Rigging and Tools is dedicated to the manufacturing of synthetic web slings for lifting that meet or exceed current industry standards (OSHA and ANSI B30.9). Only the finest domestic webbing and hardware is used so that you are assured of the best in each and every web sling. All webbing has a red thread woven into the core to serve as a warning to the operator, when exposed, the web sling has reached the end of safe use. However, red yarns are not the only criteria for determining the removal of web slings from service. When in doubt as to the serviceability of a web sling, consult your manufacturer or OSHA Standards as to proper use or removal from service. All the load charts herein are based on a safety factor of 5:1. However, all loading is based on new and unused slings and does not relieve the end user from responsibility for regular inspection for damage and serviceability. Web slings can be equipped with hooks upon request. Sling type number and Stock number as given. Length of sling, measured as shown. Width of the sling body. 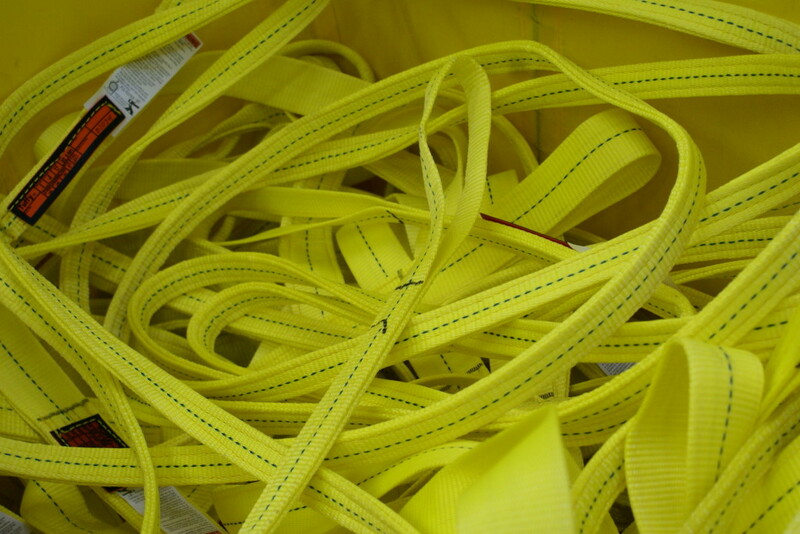 Webbing material – Nylon or Polyester. Use the options below to see sling details and capacities. Have questions? Contact our sales team today! End fittings are steel or aluminum with a slip through design which provides good choke hitching. Also can be used in vertical or basket hitches. End fittings are steel or aluminum designed to be used in only a vertical or basket hitch. Sling made with a flat loop on each end with loop eye opening on same plane as sling body. 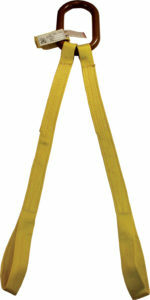 This type of sling is sometimes called a flat eye and eye, eye and eye, or double eye sling. Sling made with both loop eyes formed as in Type III, except that the loop eyes are turned to form a loop eye which is at a right angle to the plane of the sling body. This type of sling is commonly referred to as a twisted eye sling. Endless sling, sometimes referred to as a grommet. It is a continuous loop formed by joining the ends of the fabric together with a splice. These Bridle Slings assemblies are used on lifts that need multiple legs and come equipped with many variations of rings, hooks and other fittings. 3 and 4 legged assemblies available on request. Because of the wide variety of fittings which can greatly affect the rated capacity of an assembly, please contact Delta Rigging and Tools to discuss your specific lifting requirements.